Oct. 4 | Jimboy's Tacos Celebrats Nat'l Taco Day With Bogo Deals - EAT WITH HOP! 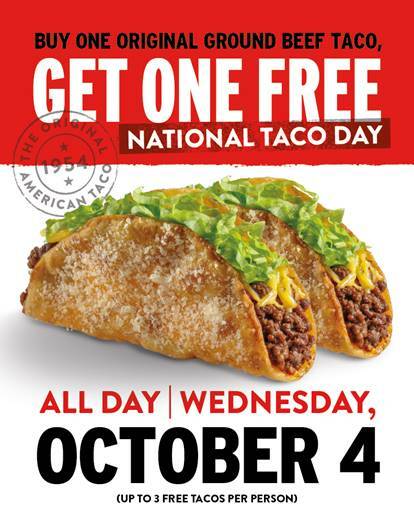 National Taco Day lands on a Wednesday this year. Isn't it weird that it's not on a Taco Tuesday?! Anyway, Jimboy's Tacos has a deal for this! Known today as the home of the Original American Taco, Jimboy’s Tacos got its start from a food trailer in King’s Beach, Tahoe, CA in 1954, when founder Jim “Jimboy” Knudson made it his goal to pioneer the best tasting taco out there. Made fresh with seasoned ground beef, freshly shredded cheese and lettuce in a crispy stone-ground corn shell dusted with parmesan cheese, the brand’s beloved best-selling Original Ground Beef Taco continues to be enjoyed by loyal guests along with its well-rounded menu of fast and affordable choices including tacos, grilled burritos, salads, enchiladas, fries and more. With 38 locations across California and Nevada, Jimboy’s has set its sights on strategic expansion throughout the Western region of the United States, and is projected to double in size by the end of 2019. Buy 1 Original Ground Beef Taco, get 1 free! October, 4, 2017. ALL DAAAAAAY LONG! Check out Jimboy's Tacos Social Media!